The new season starts in just more than 2 weeks at Monday 13th July in Neustift. 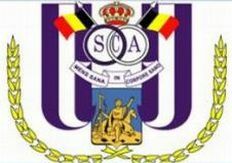 Genoa stays in Austria till Friday-morning 24th July when the team of Mr. Gasperini goes by plane towards Brussels to play in the evening against Belgium topteam Anderlecht, the former club of Anthony Vanden Borre. Maybe some of our members in Belgium and in the South of Holland have the opportunity to watch this preparingmatch to the first matches in Europa League at 20th and 27th August. The great season 2008-2009 was also the season that our 22 years old defenders Salvatore Bocchetti and Mimmo Criscrito definitively changed from talents into complete Serie A-players. Both players are at the moment in Sweden to play with Italy the European Championship for players below 21 years and are also close to the National team of Mr. Lippi. 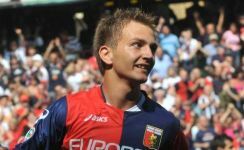 Today Genoa bought the last 50% of Criscito and paid Juventus € 5,5 million for that and last week the same deal was made with Frosinone (Serie B) about Bocchetti which costed around € 2 million. Tomorrow Mr. Preziosi also tries to keep the strikers Jankovic and Palladino with us and he probably also buys Moussa Dembélé of AZ Alkmaar. Besides all the good news it look likes our goalkeeper Rubinho leaves us. The best moment of the season 2008-2009: the 3rd and deciding goal of Diego Milito in the derby against Sampdoria at Sunday-night 3rd May 2009. At that moment Genoa played with only 9 players after the red cards of Matteo Ferrari and Thiago Motta and 2 of our players are alone in front of the goalkeeper: never seen before !! After the 10 new players tonight Mr. Blondet of Genoa told on the radio that the Belgium player Moussa Dembélé of AZ or the Dutch player Royston Drenthe of Real Madrid arrives. Personally I think Dembélé is the best of these 2, but as official supportersclub in Holland and Belgium we can be happy that a player of our countries arrives ! Our loved President Enrico Preziosi already bought 10 players to substitute Diego Milito and Thiago Motta that leave Genoa to Inter. After the central strikers Sergio Floccari (Atalanta Bergamo, 27 years) and Hernan Crespo (Inter, 33 years) also arrived central defender Nedan Tomovic (Red Star Belgrado, 21 years), midfielder Vítor Hugo Gomes Passos (nickname Pelé; Porto, 21 years) and playmaker Houssine Kharja (Siena, 27 years). 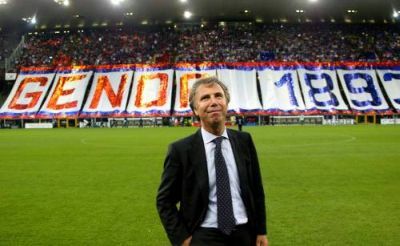 To have Milito and Motta Inter paid Genoa around € 25 million and 5 young players which were owned by the black and blue of Milano: central strikers Robert Acquafresca (21 years, last year with Cagliari) and Riccardo Meggiorini (23, Cittadella), midfielder Francesco Bolzoni (20, Inter) and the defenders Ivan Fatic (20, Salernitana) and Leonardo Bonucci (22, Pisa). Probably most of the “Inter-youngsters” will be rent next season to get more experienced because Mr. Gasperini wants a maximum of 22 players in his selection that starts the season at 13th July in Austria. mille grazie to Adam for preparing this great video !